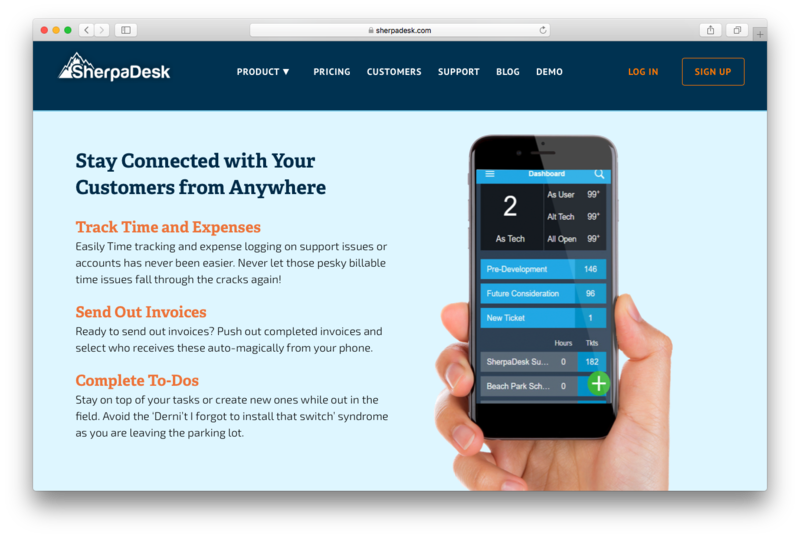 "SherpaDesk is a cloud hosted customer support solution that assists IT businesses in tracking client requests, logging time and managing projects." SherpaDesk scored 85/100 in the Support & Helpdesk category. This is based on user satisfaction (81/100), press buzz (37/100), recent user trends (rising), and other relevant information on SherpaDesk gathered from around the web. SherpaDesk is a web-based customer management and professional service automation platform that seamlessly integrates key business processes into a single robust suite. It is considered one of the most reliable, fully capable customer relationship management (CRM) solutions specifically tailored for IT businesses and professionals, giving them the ability to provide quality service to their clients. Designed for small to medium-sized businesses and personal service agencies, SherpaDesk has its features and capabilities focused on the critical aspect most professional services deal with on a daily basis, time-efficiency. Time is important in any business. The platform is designed to allow professional services companies to cater to customers in the most efficient and practical way. With SherpaDesk, you can manage your customers effectively, capture billable time accurately, and monitor your projects’ profitability seamlessly and effortlessly. Whether you’re in IT services, web design, technical support, or software development, SherpaDesk provides the tools and functions needed to be able to provide quality customer service on a wide variety of concerns and issues your clients might be having. SherpaDesk is a fully functional helpdesk solution, CRM solution, business process solution, and professional service automation solution. It is a cloud-hosted suite that offers a plethora of products and services for SMBs and customer service professionals, from time tracking and project management to asset and task management services. With this feature-rich platform, you are able to effectively monitor time throughout your organization, gather valuable data, provide crucial insights to help make smarter decisions, and even generate billing and invoices automatically for services rendered. 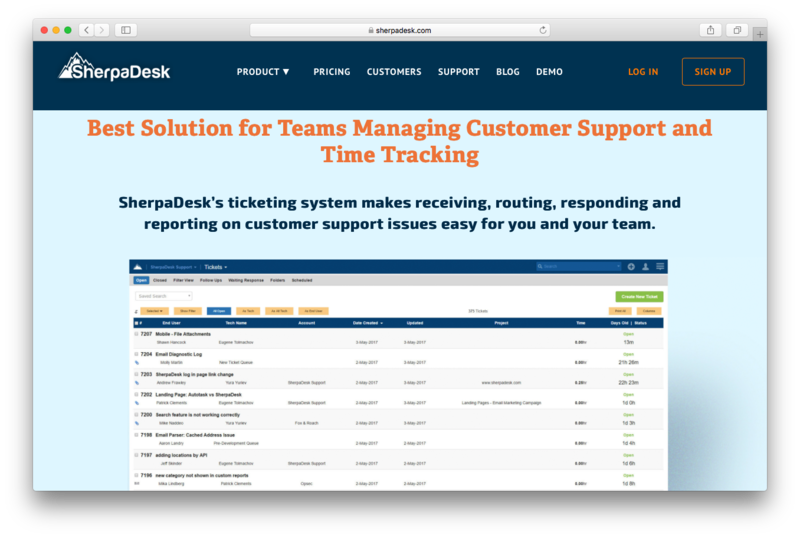 SherpaDesk provides one of the better ticketing and helpdesk solutions in the market. The system makes the process of routing, receiving, reporting, and responding to various customers support concerns and issues a lot easier and more efficient for users, especially for tech support teams. The platform offers complete visibility of the support issue in one centralized location. Staying true to its main objective, which is to make customer service and tech support as quick and painless as possible, the SherpaDesk email ticketing solution is simple and straightforward. Setting up an email dropbox is a hassle-free affair and you can then begin accepting tickets. You can configure your dropboxes and set them so one dropbox receives basic support tickets, the second one receives hardware failures, and another one recieves priority issues. SherpaDesk provides practical solutions for effectively capturing billable and non-billable time for teams. The platform introduces a variety of ways to track time whenever and wherever, which is quite crucial to businesses that want to make the most out of their time and effort when providing customer support services. For IT businesses and professional service providers, time is literally a product. The ability to effectively and accurately capture time, whether in the office, at home or on the field, is a crucial factor when it comes to growing and validating an individual’s or a team’s services. SherpaDesk, with its time tracking solution, enables businesses and teams to do just that—track time in a variety ways. There are three main methods to track time with the SherpaDesk time tracking solution. With the platform, you easily can track time on your account, project, and/or asset and support issue through an extension that can be integrated with the Google Chrome browser. Another means to capture time while providing support services is through email. When responding to tickets or providing customer support service over email, all the user has to do is enter a command that allows him or her to capture time spent and have it queued up for invoicing later. Teams and professional service providers actually get paid while answering emails. The platform’s third way of capturing time is via mobile phones or mobile devices. SherpaDesk provides employees, whether onsite or off, a convenient and practical way to quickly track time against support issues, assets, accounts, projects, and so on. The solution works on any mobile device, regardless of what operating system powers it. One of the main benefits of using SherpaDesk is its ability to make time tracking, ticketing, customer management, and other business processes a lot simpler and less time-consuming. The platform helps to manage the communication and collaborative efforts among team members, as well as customers in need of assistance and the higher ups, which results in a more streamlined and highly efficient workflow. Deployment and implementation are straightforward with SherpaDesk as well, since the solution is designed for quick and easy integration. It is designed to fit the way your personnel works instead of requiring them to adapt to a new software solution and incorporate it into day-to-day processes. The Time Tracking solution is vital to any organization that capitalizes on its workforce spending time with customers and clients to provide quality service. SherpaDesk allows users to log in, track time, and record billable hours from virtually anywhere at any time using any mobile device. Field personnel won’t have to worry about manually clocking in and clocking out when handling projects, managing accounts, or tackling support issues. Billing and invoicing is quick and easy with SherpaDesk. Users won’t have to manually calculate billable hours and analyze figures just to be able to generate accurate billing and invoices. SherpaDesk provides the appropriate billing and invoicing tools to allow you to accurately send invoices to your clients without having to worry about missed time or overcharging. From the calculation process all the way to the delivery of invoices, SherpaDesk has the tools and capabilities to streamline the process. SherpaDesk also provides users access to their cloud-hosted smart filtering technology—a feature that allows businesses and organizations to get valuable insights into their processes. Users are able to view a detailed breakdown of the hours worked by team members and agents, as well as to figure out specific areas that need more attention, time, and extra support. The different capabilities the software solution offers is an asset to any organization as they enable decision makers to effectively manage staff, direct attention on areas that are lacking, deploy the appropriate personnel to provide the right kind of support to customers, and ensure your company’s support team is paid accurately for services provided. SherpaDesk offers only two types of pricing packages: a free package for a single agent and a paid package for teams, which costs $39 per agent per month. With either package, you get an all-in-one solution that combines a comprehensive set of tools that allow you to manage your customer support business more efficiently and productively. You can essentially start with SherpaDesk for free and scale your subscription as your business grows. You may visit the SherpaDesk official website for more information on their products and services, features, and pricing. The Team package also comes with a 30-day trial. SherpaDesk is a feature-rich, easy-to-use–and-implement cloud-hosted product for businesses and organizations that need a professional service automation platform that allows for seamless integration of core business processes into a single system. The solution is designed for small to medium-sized businesses and startups. It offers reasonable pricing with excellent features and capabilities. You should consider this software solution if your business needs this type of product. Product recommendations, vendor rankings, market overview and tips on how to select Support & Helpdesk software for business. Published in April 2019. Does SherpaDesk offer multi-user capability (e.g. teams)? Does SherpaDesk offer an API? Does SherpaDesk offer guides, tutorials and or customer support? What platforms does SherpaDesk support? What is SherpaDesk generally used for? Who are the main user groups of SherpaDesk? What are some applications SherpaDesk is commonly used in tandem with?